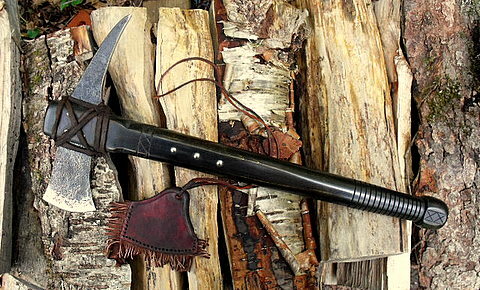 Custom-Tomahawk - Primitive Spike Warhawk. 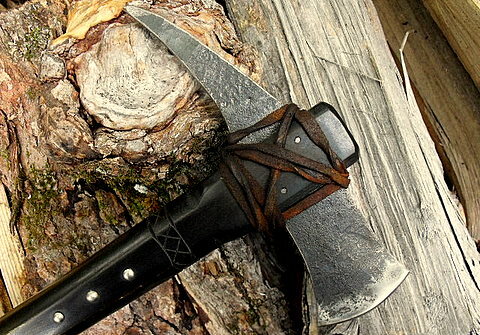 This is a brand new, original, historically influenced custom-tomahawk that I hand-forged in my blacksmith shop, The North River Forge. I specialize in hand forged reproductions of the 18th and 19th centuries. Each piece is unique. Steel: : Hand-forged from a leaf spring. Dimensions: Head overall 9 1/4" - Cutting edge 2 1/2" wide. Haft: Maple. 18" long overall. 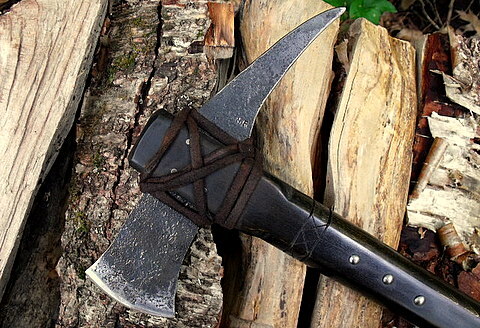 Finish: Aged finish with hammer and forge marks. 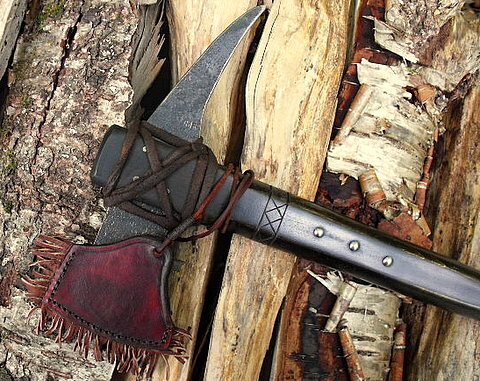 Features: Sheath decorated with a deer hide fringe. Line carving on haft. Rawhide lashing. Iron tacks. This hawk is stamped with my makers mark NR and comes with a certificate of authenticity. Great for re-enactors or collectors who crave tradition. Hand crafted in the traditions of long ago. It is a reminder of an era past. 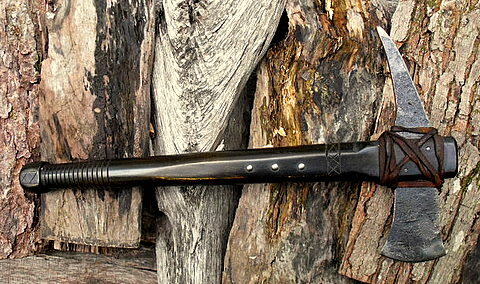 A very nice reproduction spike warhawk that will take and keep a good edge. It has never been carried or used. Functional as well as beautiful. A classic early 18th century design. Price: $230.00 plus $16 shipping. (USA- Canada) Please contact us for shipping charges and options to other destinations. Return to North River Custom Knives Home Page.